Only 6 days left to Full Release of The Mims Beginning! We are very excited, we have been developing our game so long time. This will be huge day for us. There will be a discount for first week Of Release. We really would to make as biggest traffic as we can during first days of Release it is important for us to be visible on Steam. You could help us with this by just to clicks, We created thunderclap campaign. You could join it by click "Support with FACEBOOK (or Twitter)" then "Add my Support"
It will help us a lot. Why? Thunderclap is well know and safe platform to mass audience. It means that if you'll add your support by Facebook then few hours after game Release (18th of May) it will post on your Facebook, one and only one time short message about our game Release and link to steam. More supporters means bigger help for us on first hours of Release. We are making promotion only with our hands without budget so it will be great if you could support us right there. Also you could help us if you are journalist, steam reviewer, newsman, has big group on steam etc. Just write us on squattingpenguins@gmail.com. We will send you a key for review and together we could organize some promotion. It is great because if there is no funds for promotion there are always amazing ideas. 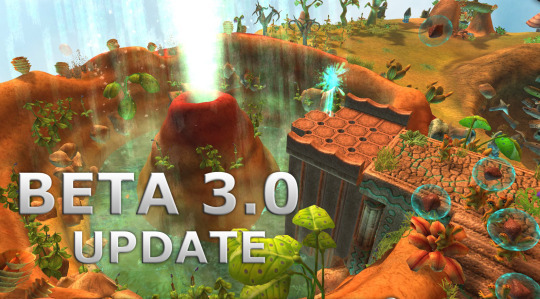 Squatting Penguins Team here, signing in to announce the release of Beta 3.0 for The Mims Beginning, including the new Survival and Sandbox modes, along with 2 completely new levels, featuring cutscenes, new enemies and an assortment of new additions. Our tiny team consisting of 3 people is celebrating the 4th anniversary of having started working on The Mims, which commenced all the way back in June 2012. It goes to show just how much effort it takes to create an indie title the size of The Mims Beginning. Four long months have passed since the last update, during which we did our best to deliver a stable, bug-free and well-polished build of the game. The Mims is now fully supported in three languages, which caused a slight setback on the release, not to mention the day-to-day grind that would sometimes slow our progress down to halt. With that out of the way, thank you for your kind understanding. The changelog might seem sparse at first, but the new additions involved numerous changes and weeks upon weeks of work. Feel mysterious and mystical adventure in strategy game.The Mims are sympathetic creatures travelling through the outer space.As their leader help them survive! "Fortunately, you’re god! Or at least, you’re basically god. I doubt the Mims can tell the difference. This means that on top of being in charge of RTS-like defense and expansion, you’ve got various “PSI” powers at your disposal – for instance, rain clouds, crowd control explosions, and buffs that turn your citizens from baby Oompa Loompas to this version of Carrot Top." "In the spirit of brevity, if you like Populous and/or found Bullfrog titles of yore to be up your alley, heave coin into the construction pool and stay tuned. The Mims: Beginning does justice to the Molyneux heyday – arguably the zenith of the quirky simulation – by being both irrepressibly charming and filled to the brim with those curious mechanical subsystems we rarely see in contemporary gaming." In 'The Mims Beginning' game we play as a ruler of the Mims colony. The Mims are sympathetic creatures travelling through the outer space in search of a friendly world to settle and colonize. During the intergalactic journey their spaceship was destroyed by an asteroid and the crew was forced to evacuate on the nearby planets which were not always friendly. Player’s goal is to perform various tasks due to reconstruct the spaceship. We can make this task easier by the proper development of our planets. The basic element which is necessary to the colony existence and development is energy. This energy is necessary to rebuild the Mims’ vitality used while performing work and proper functioning of the infrastructure. It is produced in a generator for Biomass derived from special fruit processed in the Extractor. Part of the energy can also be obtained from the flow of winds thanks to correct placement of Wind Turbines. The tasks performed by the Mims should include the expansion of the colony and picking up the Bio fruit. Some of the Mims act as a protection against the dangers lurking from various creatures attracted to our planet by scent of fruit and animals. As a ruler you can create the Defensive Mims and we also have Psi power to our disposal, some of which can be used for defence against these creatures. Mims knowledge allows them to create animals which diets are appropriate sets of fruit. Grown animals can be sent to ‘Space Market’ and exchanged for crystals necessary for further development of the colony. In order to grow fruit for the animals we need to sow seeds from various plants species. An example can be an exploding plant that throws fruit around. An important element is a planting site. A clever ruler is able to use topography thereby avoiding excessive scattering of fruit all over the planet. In case of a bad placement we can lose some crops due to fruit rolling down the edge of the planet. An equally important factor making loss inevitable would be allowing fruit to rot if it were not picked up on time. In the game we can develop buildings, plants, acquire new Psi powers, as well as learn our Mims new skills. As the ruler of the managed colony we can govern from the Psi Tower which greatly reinforces our supernatural abilities. As a result we have a range of abilities which can affect the environment of our planet. Among other things, it becomes possible to influence the development of vegetation growing on the planet. In the case of excessive accumulation of fruit we are able to reduce it with the adequate power. We also have the ability of destructive nature. One is the explosion of power that we can use for defending against oncoming predators and keep them away from our subjects. These are just a few of the aspects of the thriving colony but there are many more such as Biomass storage problems, starving animals, and preparing for upcoming events and disasters. There are two game modes to choose from. An Adventure mode telling about rebuilding the damaged spacecraft and a Free mode where a player develops a colony without any specific objectives. In the Adventure mode we struggle with the problems another Mims survivor has to deal with. They will be forced to fight not only with the geological difficulties on encountered planets, but also the threats of cosmic events. During their adventure they will come across the mysterious worlds, full of unusual and bizarre creatures and sinister plants standing in their way to find the remains necessary to rebuild the ship. Some of our groups of survivors find themselves located in places so inhospitable that their very survival will be considered as a success. As their leader help them cope with problems and survive in this hostile environment! As “The Mims Beginning” is under development there is still a possibility of change, therefore we are open to ideas from the user community. We are a duo of dreamers with different perspective on the world. One day we decided to make a video game, and surprisingly, we did. Our friend joined this crazy idea and made a magical music. Now we only need your votes to show everybody that dreams really come true and guys from nowhere can make something big. Should have sold this to NINTENDO! I have played your demo, and loved it, I am currently getting my degree in game art and design,, and I love the visual aspects of the game. I don't know if you already adressed this as you were further developing the game, but in the demo, as I played the final stage, when I upgraded the extractor to level 2 and the mims were throwing in fruit, the biomass would be shown as decreasing at times (went from 92 to 87 then 84). Also I don't know if it is intended or not but sometimes the fruit that is thrown, doesn't make it into the extractor. I also want to thank you for making it mac available and I am excited about it's release on steam. 2. What countrys summer holiday will be be released at? Hi penguins! Will the steam beta access be available also to Indiegogo funders? And when will be it relased? Thank for your informations! ༼´ง ◉◞౪◟◉༽ノ Awesome game for Linux/SteamOS. Kiedy będzie dostępny klucz na steam dla tych co wpłacili na indiegogo? Ja dałem na "Small Egg". The Mims Beginning has been Greenlit and is now listed in the Steam store. For the latest information, purchase options, and discussions for The Mims Beginning, please see it on the Steam Store or in the Steam Community.